As a librarian, I understand the importance and value of storytelling and, as a marketer, I know how convincing narrative can be – but it’s as a human, that I really get the power of a good story and its ability to inspire, educate and connect. Despite the modern world growing increasingly frenetic, a well-told story is still the most engaging way to explore different perspectives and learn new things – particularly when there’s some emotional resonance. 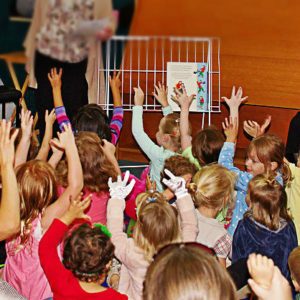 At libraries all over the world, kids sit on the floor in a circle for story time, listening earnestly to fairy tales, while learning how language works and developing an interest in the broader world. As adults we replicate that sense of shared entertainment and satisfy our need to be part of something bigger through books, sports, movies, TV – and particularly social media. From Facebook to Instagram and beyond, there is an onslaught of communication tools (check out Marketing Technology Landscape Supergraphic for 5000+ of them! ), but all that technology is useless without the stories that connect us. We crave to understand other people and to feel like we’re not alone in the world. In everything from reality TV to advertisements that tug on our heartstrings, storytelling touches the core of human experience. We may no longer sit on a library floor for amusement and perhaps it’s been decades since we told ghost stories around a campfire, but storytelling is not dead. If anything, the strength of a good story is more important than ever. A side effect of having information constantly at our fingertips, is that we expect everything to have a backstory. Consumers are looking for reasons to pick one brand over another and credibility combined with emotional connection is strong motivation. How does ‘Once upon a time…’ connect you, your business, your brand? What stories do you tell to tap into the age-old desire to be part of something bigger? Storytelling is powerful. Don’t let the profound humanness of narrative pass you by. This post was originally published on Integrated B2B.